Hello, hello! Happy Thursday to you all! Today is a special day as exactly six years ago I wrote my very first post for this blog. Crazy, isn't it? Things have changed, of course. I don't make the same things I used to (which is definitely a good thing because those first mug rugs make me laugh every time I see them :). Sewing and designing patterns has become my job instead of being a hobby, and I definitely have less time for sewing just for the sake of sewing. What haven't changed, however, is my love of making and the enjoyment I get from sharing it with you all. So, from the bottom of my heart, thank you!!! Thank you for coming along on this super fun creative journey with me. I couldn't do what I do without all your encouragement, support, and feedback. And, to celebrate, I have a giveaway for you. The giveaway is open worldwide and three lucky readers will win a pack of 15 screen printed charms pictured above, plus a choice of three pdf patterns from my etsy shop. To enter, simply leave a comment below letting me know what fun project you're working on at the moment. Mr. Random and I will choose our three winners on Monday (May 1st) noon. And, in case you'd like to go ahead and purchase some patterns right away, I have an etsy shop discount coupon for you. Use SIXYEARS during checkout and a 40% discount will be automatically applied to your shopping cart. Discount code valid through Monday, May 1st. Good luck and happy sewing, friends. I just wanted to pop in real quick and let you know I've added quite a few screen printed fabric panels as well as some charm packs to my etsy shop. Oh, and I'm not planning on doing another shop update any time soon so in case you see something you like grab it now as once it's gone it's gone. One of my go to projects when I feel creatively stuck and completely uninspired is making grocery bags. I know, super glamorous, right? :) I use Grocery Bag pattern by Michelle Patterns as these bags are quick and easy to make, and I get to play with pretty fabric without thinking too much. Lately I've had quite a few of those "stuck" days with mile long list of things I needed to do but no desire to tackle any one of them. So I raided my stash and decided it was time for yet another grocery bag making session. As you can see I like to work in batches when making these bags, so I went ahead and made three bags in one go. I really love the unique but super effective construction Michelle came up with as it makes for very practical and durable grocery bags. The handles are a bit fiddly to make, but definitely worth a bit extra effort. You can see in the photo above how I make them. Instead of cutting all four handles out, I just cut one pair of handles, pin them to second fabric, stitch and then cut the handles out. I find this to be a quicker and more precise way to make my handles. How about you? What do you do when you get stuck? This pouch has been in the works for quite some time as I wanted to make sure I got all the dimensions just right and I'm excited to offer it in three very useful sizes (full size templates are included with the pattern, of course). Small size is perfect to keep tiny random items inside one's purse organized, medium size is just right for pencils and pens and the large one would make a wonderful toiletry bag or a dopp kit. 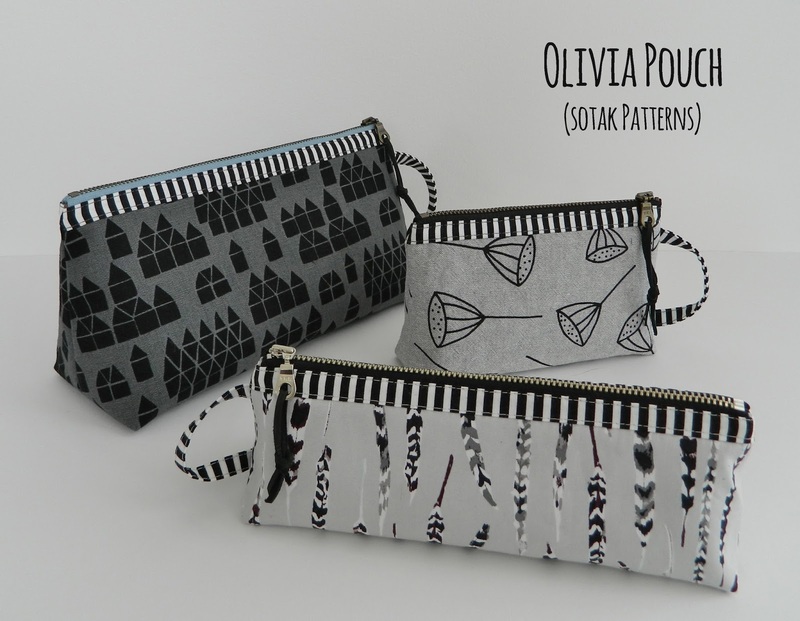 I used a variety of cotton and cotton/linen blend fabrics to make these pouches and I absolutely love how they turned out. I hope you will love this pouch's "tent" shape with straight side edges and wide bottom plus the little side handle as much as I do. As always, this is an instant download pdf pattern available worldwide and you can purchase it by clicking on the link below or by going to my etsy shop. I'm offering this pattern for an introductory price of $5.00 for the next 48 hours, after that the price will go up to its regular $7.00. Thanks for reading friends, and happy sewing !!! I've been meaning to make a protective case for my laptop for ages now but I was totally stuck on what design and fabrics to go with, of course. And then, while browsing Pinterest the other day, I came across these simple, yet wonderfully stylish cases and I knew right away a padded giant pouch of sorts was the way to go. I combined some of my screen printed fabric with black and white striped fabric from my stash and loosely based this case on my Purse Organizer (just made it much bigger and with less pockets). I then added some fun bag hardware and leather accents to spiffy the case up a bit and I absolutely love the final look, especially that zipper tab. I must do things like that more often. I love how this case turned out and it's a perfect fit for my laptop and the charger. Improv piecing is without any doubt my most favorite ever way to make a quilt. So, when I wanted to make a mini quilt for my studio (I'm currently decluttering and organizing like a maniac and will show you photos of my progress soon) I knew improv piecing was the way to go. 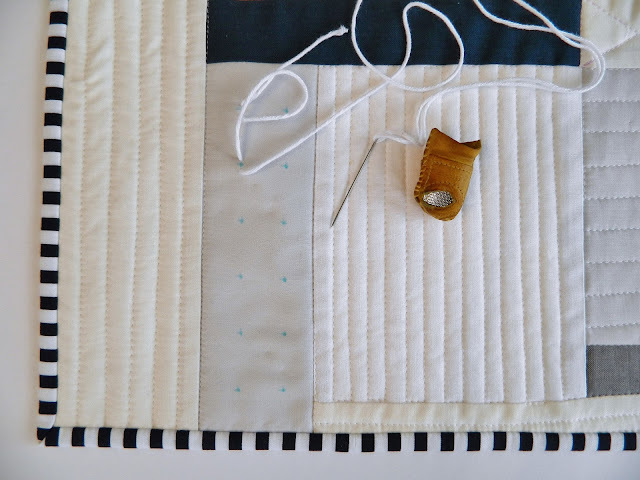 I'm a huge fan of Carolyn Friedlander's fabulous quilting style and this mini is a direct result of all the wonderful tips and teaching Carolyn shares in her Creativebug class. Even the back looks pretty cool, would you agree? Off I go, more organizing to be done. I've long been admiring these absolutely stunning Atelier + S patchwork linen and sashiko tote bags . So beautiful, aren't they? I love how they are sort of rustic looking, yet pretty and stylish at the same time. So, the other day when I found myself with a bit of spare time and no project to work on, I decided to make a pillow cover inspired by these totes. I thought I'd work on patchwork base first, but I really wanted to get stitching, so I decided simple square of Essex linen will do. I drew the lines using ruler and water soluble fabric pen. I even had some sashiko thread on hand so I was able to get stitching right away. Oh, and I adhered fusible fleece to wrong side of my linen before I started stitching since I found a single layer of linen to be a bit too flimsy for my liking. This was one of those almost instant gratification projects as I finished all the stitching while watching a movie one evening and turned it into a pillow the next day. The pillow cover finished at 18" square and has an invisible zipper closure for easy removal. What are your go to projects when you don't have much time but still want to make something? Do tell. I'd love to know.